Canadian, family-owned company Vegpro International is introducing their most popular products to Western Canada. 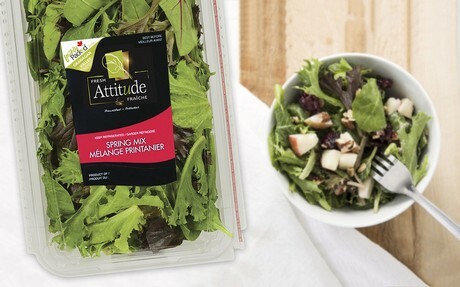 Fresh Attitude prewashed baby lettuces and salad kits have officially made their debut in the produce sections of Western Canada's grocery stores, and can be found in major retailers such as Walmart, Sobey's/Safeway and Save-on-Foods. The lettuces and salad kits are grown in the Okanagan Valley in season, and packed locally year-round. The company purchased 700 acres of farming land in the North Okanagan and are leasing parcels of nearby organic certified land to bring fresh produce to stores in the area. A brand new, state-of-the-art 70,000 square foot product washing and packing facility was also built in Coldstream, B.C. Not only will Fresh Attitude products provide healthy, safe produce options for shoppers, but the high quality working environment provided by the company is creating employment opportunities in the community. The Van Wilden family, with three generations of farming experience, is the foundation of Vegpro International and understands the importance of growing and packing local as much as possible. "We believe proximity to our fields and operations translates into tangible gains for our customers such as greater ability to adjust to their inventory needs," said Luc Prévost, Executive Vice President, Sales and Marketing. According to newswire.ca¸ the decision to expand into Western Canada was made as the company saw an opportunity to build on its vertically integrated business model, which has proven successful in its facilities in Eastern Canada and the United States. Fresh Attitude already represents 68% of National Category growth, and plans to continue introducing new, innovative products to grocery store shelves in the future.